An interesting theory was propositioned to me after watching the live-action Ghost in the Shell remake. It goes like this: if a second-tier movie has to slap its marketing on every bus and billboard in town, it’s probably not a very good movie. It sounds like nonsense, but it has some credence in our day and age. A handful of bad reviews - especially online - can kill a film’s momentum dead. This is incredibly so if said film has been courting negative publicity before its release, as Ghost in the Shell most definitely has. Its original source material, a feature-length Japanese animated classic that instilled some refreshing existential philosophy into the cyberpunk genre, also had the definition of being a distinctly Japanese story with a distinctly Japanese cast. With the continuing furore of Asian actors being overlooked for its Western overhaul, it’s not completely far-fetched to think that Paramount Pictures could have chosen to sidestep accusations of whitewashing with ubiquitous print campaigns subliminally reminding us that their film is Very Good™, and worth seeing regardless. That’s probably also why Los Angeles - where I live - has had its transit services and freeway ad hoardings dedicating themselves to flaunting a morose-looking Scarlett Johansson anywhere and everywhere I go. Unfortunately, it’s all for naught. For as headlining as its cast may be, and for all the distracting CGI it attempts to thrust upon the viewer to hide its flaws, not even solid performances from its main cast can prevent Rupert Sanders’ re-telling of the original from being staunchly mediocre. It’s not a case of liberties being taken with the source material either. Frustratingly, it is that it doesn’t seem to understand its underlying themes at all. It does at least have a loose understanding of how everything sets up though. It’s the near-future in an unnamed city (though likely to be Tokyo), humanity has gone fully into bed with machinery and the revolution of cybernetic enhancement is at hand. Practically everyone can switch bits of their body out for robotic parts if they want to, but only recently - a year before the movie’s main story begins, in fact - has science been able to achieve the transplant of a living human brain into a fully artificial body (or ‘shell’). That’s exactly what the boffins at Hanka Robotics, one of the city’s numerous all-powerful conglomerates, have managed to achieve though. A year on from their monumental breakthrough, the fruit of their labour - Major Mira Killian (Johansson) of the corporate counter-terrorism unit, Section 9 - is proving to be an incredibly useful asset to the team she now operates under. There’s just one issue from Mira’s perspective - any recollection of a memory from before her transfer to a robotic shell is almost entirely wiped. Although she has a single, fuzzy memory of her family dying to get her into the country (again unknown, but likely to be Japan), her lack of a former identity is a side-effect which, through her conversations with fellow Section 9 agent and confidant Batou (Pilou Asbaek), is revealed to be giving her some existential angst. Luckily, there’s a villain on hand with the potential to give her that much longed-for mental jolt: a mysterious hacker by the name of Kuze (Michael Pitt), who’s been targeting Hanka’s own line of automatons as a means to attack the corporation’s higher command. 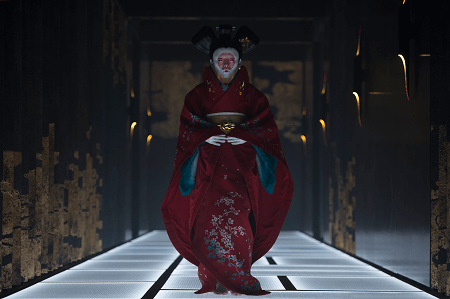 His own deadly appropriation of Hanka’s geisha-bots during a meeting between Hanka officials and an African diplomatic party - one that Mira herself is on hand to protect - is just one of a number of criminal acts that have gotten him Section 9’s attention. But it’s not just Hanka’s products that Kuze has intimate knowledge of. He also appears to know a thing or two about Mira as well, and as she is sent on the hunt to bring him in, it’s only a matter of time before she comes face to face with both Hanka’s nemesis, and the truth behind the company’s operations - with the real, earth-shattering answers to her own origins in tow. Though there are a few notable changes there that fans may cry foul over (wait, no Puppet Master? ), ultimately it’s not too removed from the plot of Mamoru Oshii’s original work. It also has the a sizeable number of recognizable characters from the franchise as well - Section 9’s regular bunch of cybercrime stoppers have also been injected here for fans to appreciate. 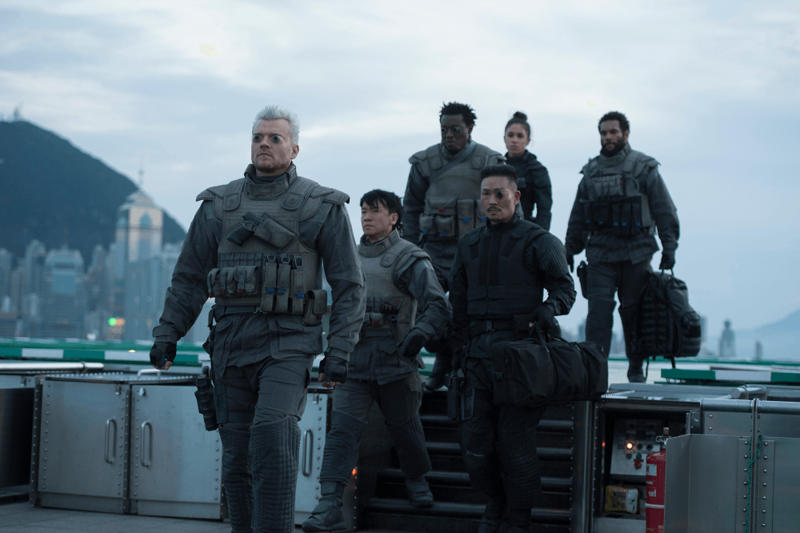 Alongside Batou, Mira is also joined by series stalwarts Daisuke Aramaki (a notably apathetic Takeshi Kitano - even for his standards), Section 9’s wily chief of command, as well as the 100% human, vehemently non-cybernetic detective Togusa (Chin Han), among others. But while it sounds like the right box-ticking on paper, it doesn’t take long for the film to show its flaws. The opening scenes show us how Mira came into being - artsy long-exposure slo-mos of a humanoid synthetic being put together, with all the audial overtures of this being a miraculous creation of life to go with it. Even if it’s not a patch on Westworld’s opening, it’s still a promising opening credit sequence. But then two of the film’s additional characters, Dr. Ouelet (Juliette Binoche) and Cutter (Peter Ferdinando) - Hanka’s chief of design and CEO respectively - start talking, while the recently-conceived Mira lies dormant in their midst, ready for activation. It only takes this brief exchange to demonstrate that Ghost in the Shell’s script is concerningly weak - some hackneyed dialogue about Mira’s purpose with who and what she is, delivered with little room for intrigue, is all we get for initial expose. This then rolls into the following scenes, where additional characters are introduced to the fore with an unrelenting determination to tell us explicitly who they are, instead of having the film’s direction show us. 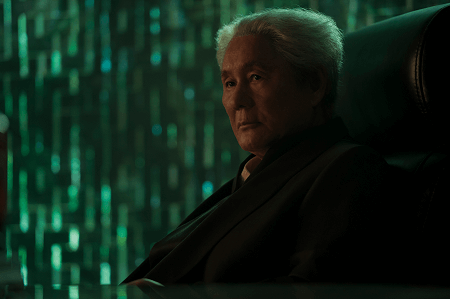 This is especially the case when Section 9’s operatives get together for a first debriefing following Kuze’s first attack on Hanka - a chance, you might think, for the film to show the chemistry within this close-knit team  (something various entries in the original franchise absolutely nail). Unfortunately, it falls completely flat - with Togusa’s awkward rebuttal of his decision to not go with any cybernetic implants, and uninspiring quips from the rest of the crew, these scenes largely fail to give any of its characters a sense of personality, or build camaraderie between them. Ultimately, they contribute to an opening half hour that, instead of breathing life and purpose into the movie, feels brute forced, stilted and cold. It should be noted too that the awkwardness doesn’t stop with the cast’s opening exchanges. Ghost in the Shell’s heavy reliance on CGI all throughout its runtime - a trait you’d think would enhance the cyberpunk atmosphere and themes - results in some awfully garish shots at certain points. This is particularly the case when showcasing its many, many camera pans over the city landscape - with which we are treated to an ugly mish-mash of grey monolithic towers interspersed with gigantic, terrible-looking looping holograms that seem to serve no rhyme or reason, save to indicate that this sprawling metropolis’ city planning department are in need of firing on artistic grounds. The effects definitely look better during the action sequences, which often rely on much more confined scenery. But the film is clearly quite proud of showing off its world to you - likely as some kind of misguided homage to the original movie’s ability to evoke a dark, neon magic with its own similar panoramas. Unfortunately, the art direction involved don’t even get close to achieving that - leaving the film grasping for other approaches to keep itself from descending into full drudgery. Continued tribute and emulation of the original is certainly one of the things the movie keeps coming back to - despite frequently failing to capture its techno-spiritual sense of awe. Scenes from the animated version are present throughout, and are almost identical shot-for-shot: certain moments such as a fight sequence between Mira and a ‘hacked’ augmented truck driver in a flooded courtyard, her final climactic encounter with a ‘spider’ tank, and her dives off of skyscraper roofs into the fray of combat were definitely thrown into the movie to please a skeptical fanbase. These are actually the better moments of the film too - when the film instead tries to be original with its action, it comes off as remarkably bland and predictable. It’s also no real fault of the acting talent put to task here either. As Mira, Johansson still puts in a strong performance despite the numerous script failings, and the controversy surrounding her casting. She may not be Motoko Kusanagi - the original’s main protagonist who’s been curiously and controversially un-Japanified here - but she’s still very close, instilling the same kind of stoic self-introspection, and a robotically nullified manner of speaking, that made her Japanese namesake character such a compelling lead in the original. 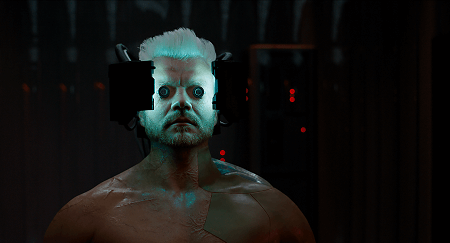 Alongside her, Asbaek’s Batou is decent as well - both his and Johansson’s scenes together succeeding in developing the same sense of conversational intimacy that his character and Kusanagi share in the animated film. But it’s only when we finally put a face to the antagonist hacker Kuze that the film becomes truly engaging - if only for a short while. 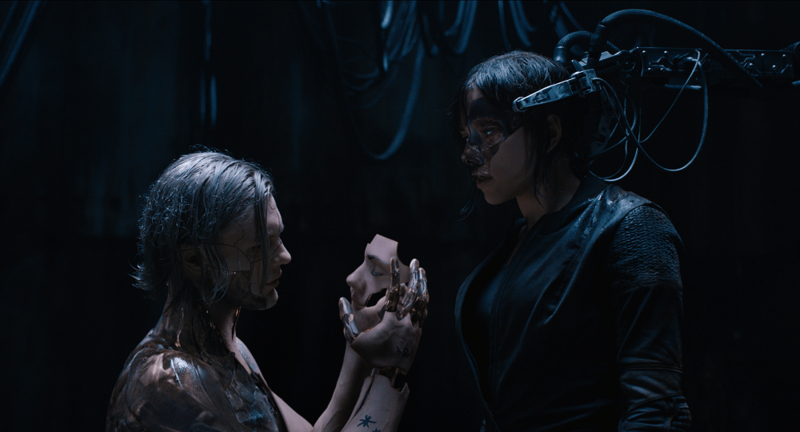 Pitt’s performance as the main villain of the piece is more functional than outstanding, but the key scene involving his meeting with Mira at the film’s middle is a rare moment where the film gains some palpable dramatic tension. With such satisfactory performances put on by the central cast figures at this point, it’s even possible to believe that they could pull this film out of the doldrums that its opening left it lounging in. And that’s when the climax - focused around an awful attempt by the film to try and explain its questionable casting choices - promptly kicks you in the balls. 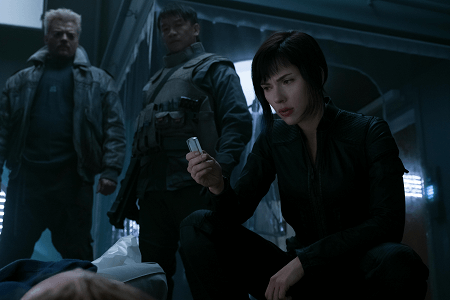 There won’t be any spoilers for the hows and the whys that it is so, but Ghost in the Shell’s ending doesn’t just squander the promise of its middle act - it also makes a mockery of the franchise’s legacy as well. In an incredible feat of inept, condescending writing, the unveiling of Mira’s past happens to not only act as both a flimsy explanation for why Johansson was cast over an Asian actress in the lead, but a proud proclamation that the themes of the original movie - even in the face of so many scenes being lifted straight from it - are trivial compared to just delivering a good ol’ Hollywood-fashioned ending. Fans of the first movie will find it particularly disheartening that the original’s riffing on humanity’s evolution under the rampant advance of technology - both natural and metaphysical - is tossed aside to instead relay the simple tale of a female Robocop. And it serves as a final, appallingly concocted nail in the coffin for a movie that frequently ties itself in knots to try and shake the accusations of racism it’s been subjected to, before simply giving up and becoming an even bigger farce than even initial online opinion could predict it to be. As far as Western adaptations go, Ghost in the Shell is not a completely terrible rendition of a much-vaunted animated classic. Even if a lot of its better moments simply come via copying scenes straight out of the original or through its cast fighting to overcome a rushed, poor script, it’s still technically sufficient enough to provide some entertainment for those looking for a half-brained cyberpunk romp. But compared to the very film it’s trying to imitate, it is nowhere near smart enough, or good enough - and it needed to be both in order to escape its justifiable race-oriented criticisms. Ghost in the Shell is currently showing in all major theaters.